Pavi's Platter: Vegetable Dum Biriyani ! Vegetable Dum Biriyani is a rich rice delicacy with a combination of colorful veges and spices. It is the vegetarians delight and makes a sure presence in parties. It is prepared in many ways... in cooker.. just as an one pot meal with all veges and rice cooked together .. or rice and veges cooked separately and let it sit in dum for some minutes where the rice absorbs the vegetable flavors. Today it is veg dum biriyani.. and i will post the other ways too soon. I just made this with the vegetables i had at home without any prior plan. I made this for my special friend Nan during her stay with me and thanks to her for clicking some lovely pics patiently from the beginning to end. 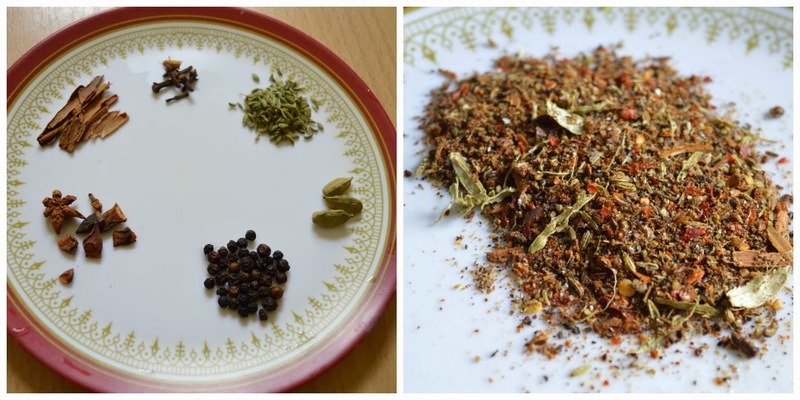 Take all the shown whole spices and make it to a coarse powder. You can also add some big cardamom, mace and stone flower if available. Slice one medium size onion , green chillis, chop mint leaves and keep other things like curd, lemon, above ground spice powder ready. Slice thinly two medium sized onions and brown them. You can either deep fry them in oil, shallow fry them in a pan or brown it in an oven. I shallow fried it with little oil. Take some whole spices again to cook the rice. Take a heavy bottomed vessel / handi or stockpot and add some ghee / oil and then add the sliced onions and fry them. Then add beans and carrot and saute for them another 2 - 3 minutes. Add ginger garlic paste, corn and green chillis. Mix well and close and cook for 5 minutes. Then add the capsicum, broccoli and mint leaves. The vegetables are added in order based on their cooking time. Once all the veges are half cooked, add the spice powders, salt and mix well. Add some water and let them cooked with the vessel closed. Meanwhile boil lot of water in a big vessel and add the whole spices to it. Add 1 tbsp of oil to it and when the water comes to boil add the soaked rice and needed salt. 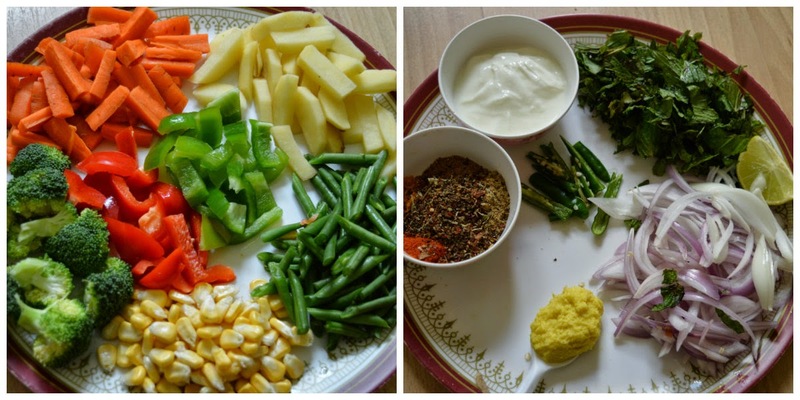 When the vegetables are cooked 90 -95% add the cup of yogurt. Check the rice , it should be only 85 - 90% cooked. Fliter it in a colander and keep aside. Now take out half of the cooked veges, and spread half of the rice on it. Spread some mint leaves, ginger , brown onions and ghee on it. Add the remaining vegetables and spread them as a nice layer. Now spread the remaining rice evenly. Now add the left out mint leaves, ginger, brown onions and ghee. Sprinkle the saffron milk (or use yellow food color). You can also sprinkle some rose water. Close the lid with a cloth below it and let it be on the stove for 20 - 25 minutes in the lowest heat possible. If you are not able to adjust to very low.. after 10 minutes place an iron tawa on the stove and keep this vessel on that. After 25 minutes, your kitchen is filled with a nice aroma for sure when you open the lid. Squeeze lemon juice on it. Do not overmix the biriyani.. Take the rice along with the vegetable layers and serve. Garnish with brown onions and coriander leaves and serve with raita. Do try out this biriyani and also the Chicken Dum Biriyani .. You will never think of eating outside once you master these at home. Reach me at pavithiravijay@gmail.com for any queries. Thanks for the step by step instructions ! This turned out to be yummilicious ! !